The perfect combination of freshly picked asparagus, a soft runny egg and a light, tangy dressing. To make the dressing: in a small bowl mix together the olive oil, lemon juice and seasoning. Poach the eggs in a pan of simmering water for about 3 minutes or until the egg whites are opaque. Remove with a slotted spoon and drain on kitchen towel. Serve the asparagus and shallot mix on 2 plates, sprinkle with torn parsley leaves, then top each with an egg and drizzle over the dressing. 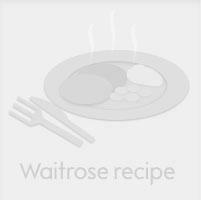 As an alternative to asparagus, try essential Waitrose Green Beans instead. Cook the beans for longer, until they’re tender, but with some bite. Waitrose Sauvignon Blanc, Viña Valdivieso 2008, Casablanca Valley,Chile. Sauvignon Blanc is wonderful with asparagus, and this vibrant example has crisp, citrus flavours and a zesty finish to match the lemon dressing.